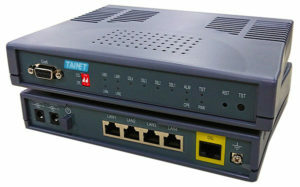 TAINET releases G.SHDSL.bis EFM/ATM P2MP - Comet 160xF and Comet 160xFM - Tainet Communication System Corp.
Comet 160xF and 160xFM EFM/ATM series supports high-speed dedicated symmetrical data transmission and utilizes DSL bandwidth. The automatic line rate adjusting can be up to 15Mbps over 2-wire copper line symmetrically. Comet 160xF and Comet 160xFM series typically works as an Ethernet extender, with up to 8wires that could enhance the line rate and provide aggregated bandwidth up to 60Mbps.Furthermore, Comet 160xF and 160xFM EFM/ATM series is fully compatible with TAINET iEAC-16, the intelligent Ethernet access chassis. This combination is designed to work as a central office especially for long distance Ethernet Access Service. It covers the ADSL/VDSL’s disadvantages of distancelimitation by offering multi-pair bonding services.